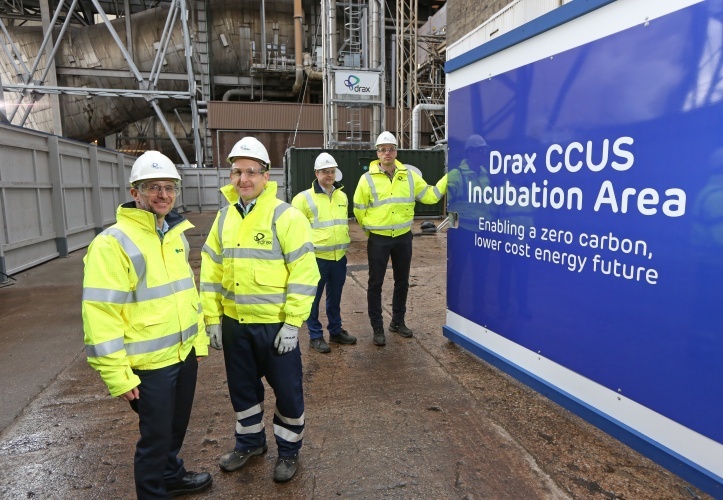 Drax Power Station’s bioenergy carbon capture and storage (BECCS) pilot has sequestered its first carbon dioxide, in what the company claims is a world first. Developed in partnership with Leeds-based C-Capture, the demonstration unit will gather just one ton of CO2 per day, a drop in the ocean of Drax’s overall carbon output. If scaled up, however, the technology could potentially be used to help decarbonise the energy sector, with Drax claiming it could become the world’s first negative emissions power station. “Proving that this innovative carbon capture technology works is an exciting development and another important milestone in our BECCS project,” said Drax Group CEO, Will Gardiner. “Climate change affects us all so this is of real significance – not just for us at Drax, but also for the UK and the rest of the world. Announced last May, the pilot BECCS unit was commissioned in November. It uses a proprietary solvent developed by C-Capture to isolate the carbon dioxide from the flue gases released when biomass pellets are burned. Work to establish the compatibility of the solvent with Drax’s biomass flue gases was completed last summer, along with a lab-scale study into the feasibility of re-utilising the flue gas desulphurisation (FGD) absorbers at the power station. Data from the BECCS pilot will now be analysed to establish the potential of the technology to be scaled up. could become the world’s first negative emissions power station. I recall as a teenager a school trip to a vast printing works (it was that of Odham’s Press in Watford) that had systems in place to recycle the solvents that were used to carry the coloured inks to the printing plates/cylinders. What amazed the guy taking us round and MJB was that the amount reclaimed/recycled was greater than that being applied. The only explanation that could be given was that there were (like the methane placed in the atmosphere by 100,000,000 cows?) other sources of gas in the area? And it was not April 1st. The greatest, and very well-proven, carbon capture and storage facilities are the mature trees in the US that are being cut down in miilions of tons a year to be burnt in Drax. Surely the whole selling point of burning pellets is that in the l mid / long term it’s carbon nuetral? I would rather see however Drax have acres of fast grow reeds / willow etc that can be burnt than another mass of concrete at the plant. The overall reduction in CO2 from shipping versus locally grown fuel would save tonnes of Co2 itself. I concur with John Hurst, lunacy of the first order.